There’s something smile-inducing about buttery shades or sunflower tones, don’t you think? We’re testing that theory today. 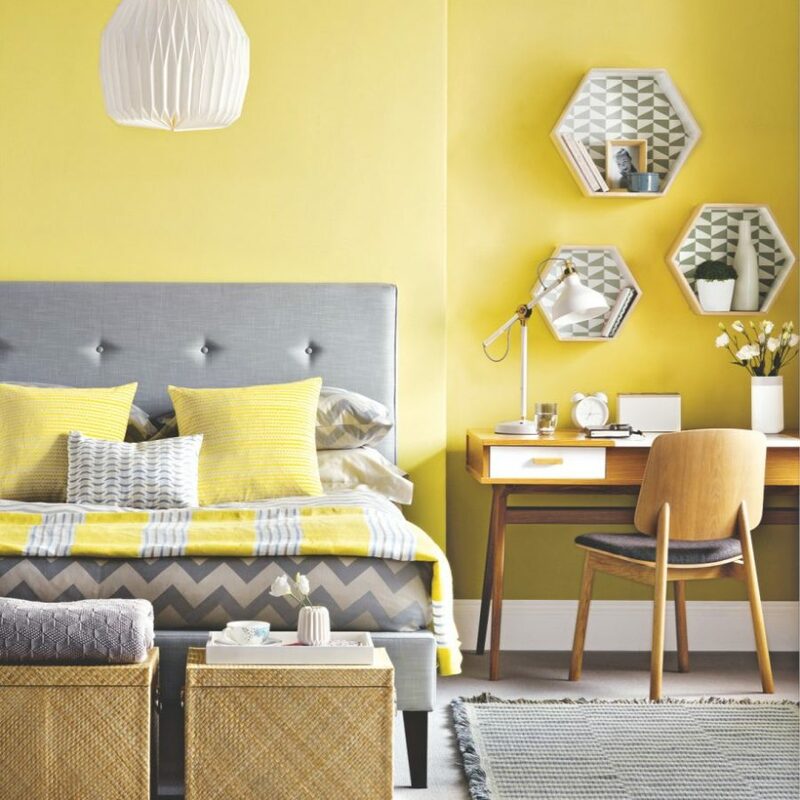 We found 15 happy, yellow bedrooms that will inspire you to add a bit of these colors to your own space. From mixing with blacks or whites to contrasting with blues, there’s definitely something for everyone to grin about below. 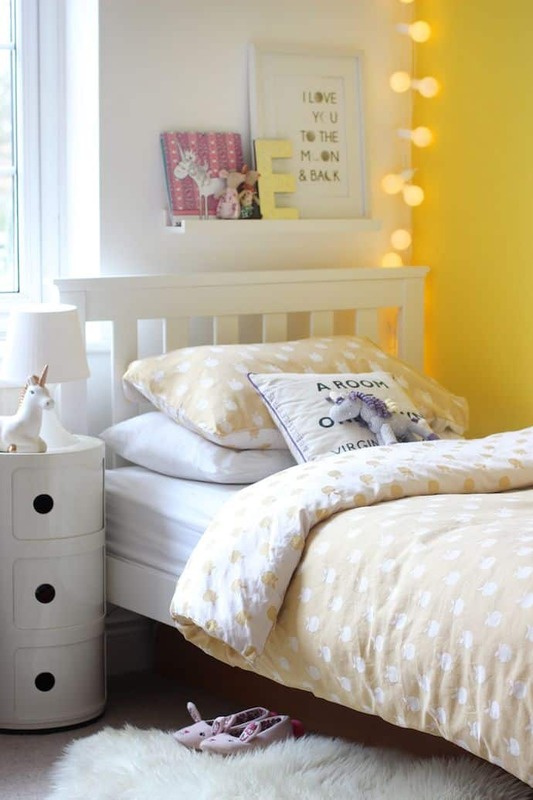 Growing Spaces is our first stop among our list of yellow, happy rooms. 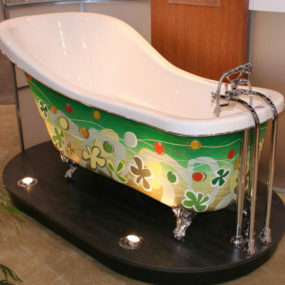 And this one was made for a young lady full of vivacious spirit. Those prints and charming accents come together so nicely in this joyful space. 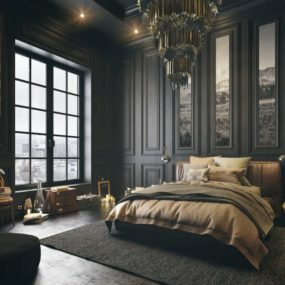 And then over at Houzz, we found a bedroom infused with a Victorian quality. There’s a royal feeling surrounding this golden yellow and its gilded accents. And that headboard and floral pattern really punch up the nod. Here’s a more minimalist style space that caught our attention over on Pinterest. 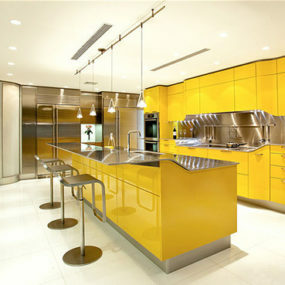 But still, even in a room without too much fuss, there’s a certain spark that yellow can bring. And the combination of sunny and butter yellows make a great pairing. 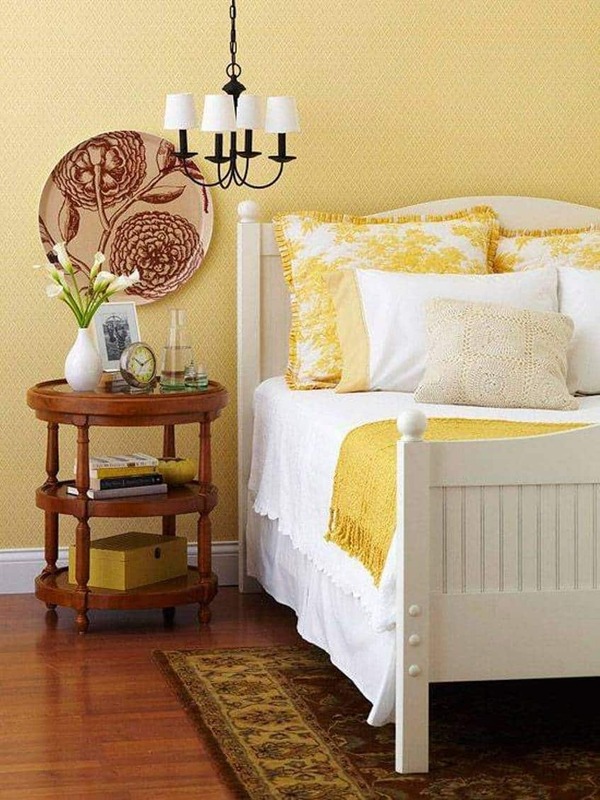 BHG gives us a more traditional take on the classic bedroom, and its yellow dressing. More of a golden mustard, it pairs well with both creams and browns. And it also holds traditional, wooden furniture well too. 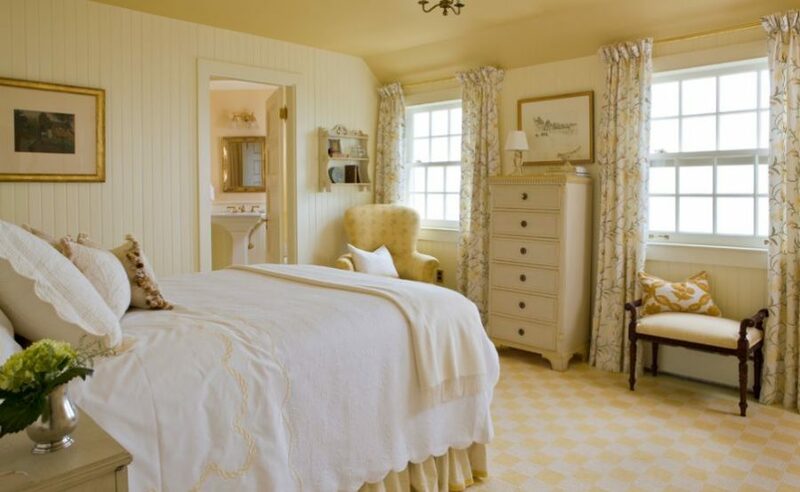 We were swooning for this gorgeous, feminine bedroom. 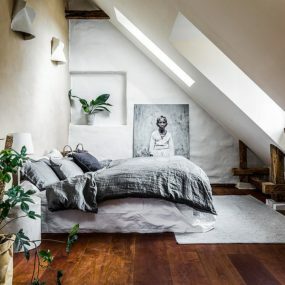 Reminding us of a luxury cottage, Homedit featured this space a while back. We love the cream and soft yellow duo, don’t you? 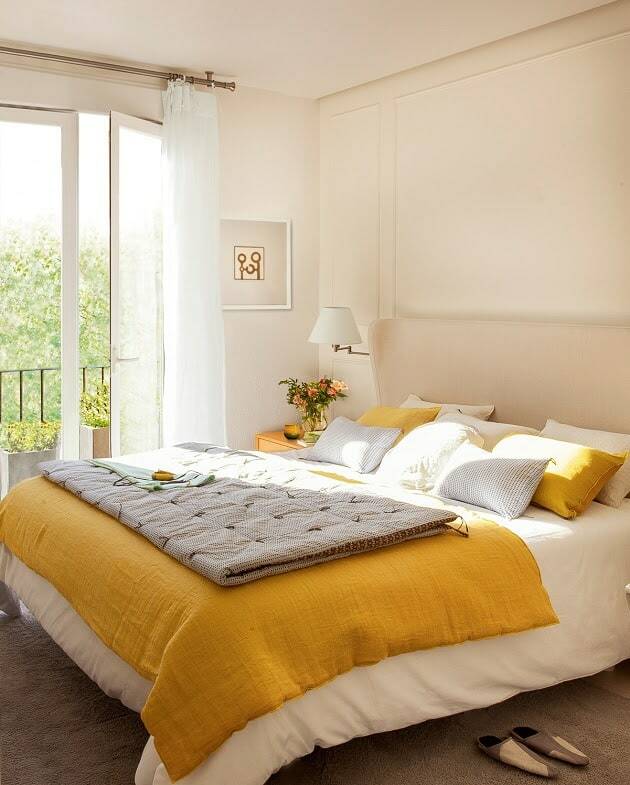 We found another creamy and golden yellow combination over at Decorisme. 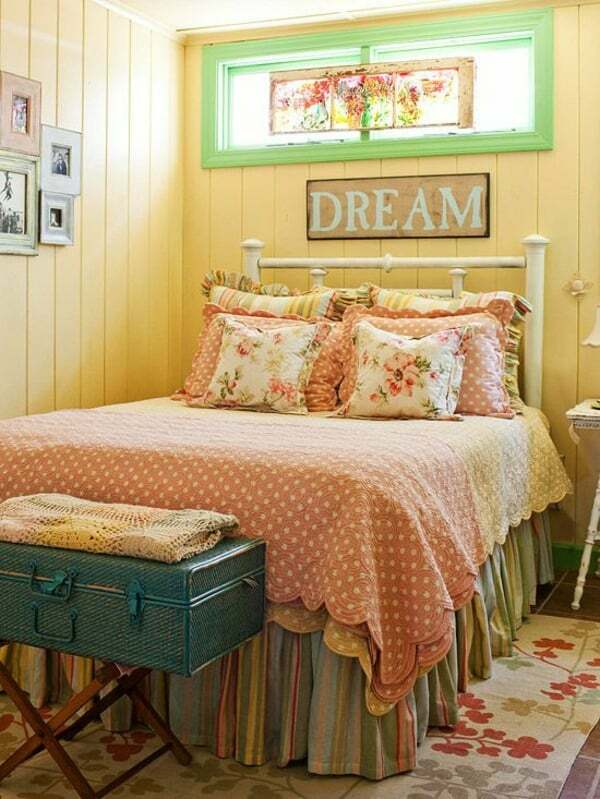 This too had a cottage, vintage-vibe that we were really inspired by. This space is truly all about texture and this happy shade sets a gorgeous foundation for it all. 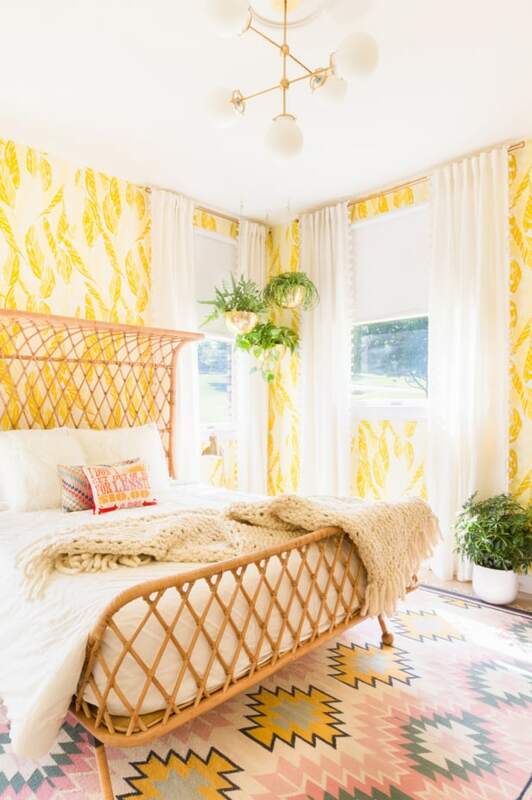 A Beautiful Mess set the bar with there stunning, print-filled bedroom. We love how yellow is the stage of the show here but it’s the patterns all around that bring life to the area. It’s more personal this way and full of fun! 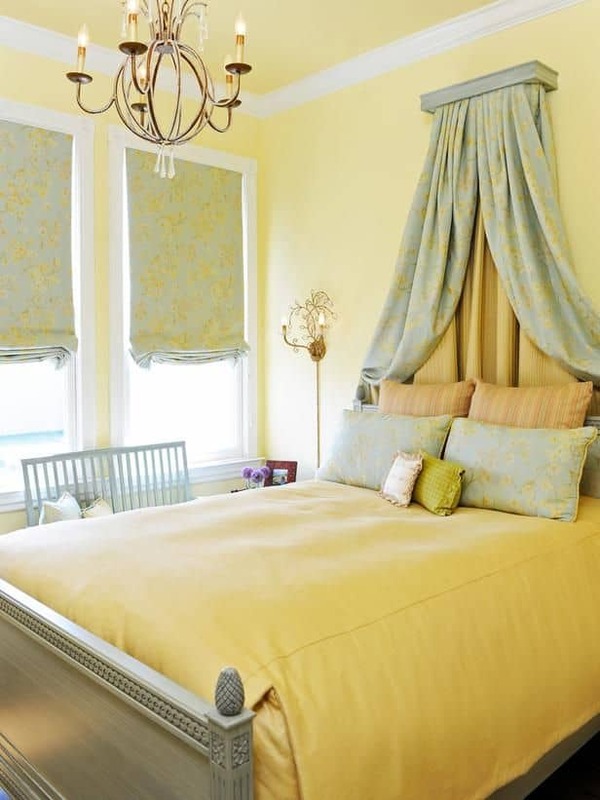 Another subdued area to peek at from BHG, we love how well yellows play along with natural sunlight. 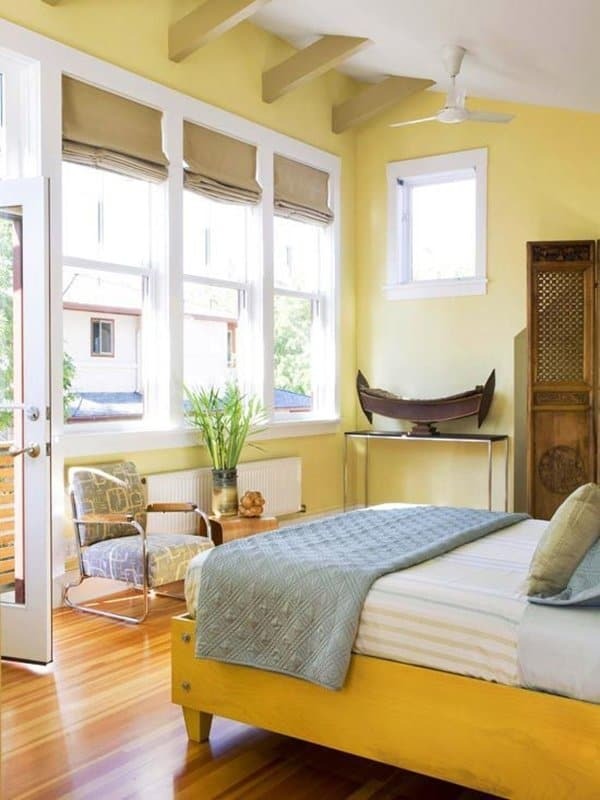 So, if you have a bedroom that will be getting a lot of rays from the windows, don’t be afraid to dress it in a butter tone. Everything will be bright and light this way. Mr. Kate had us falling in love with this modern masterpiece. 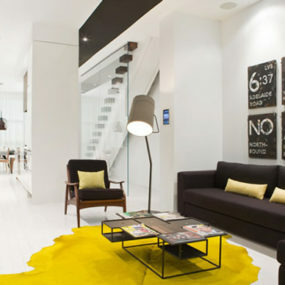 Bright, mustard-toned yellow and crisp, whites play nice together too. But it’s the sharp edges and contemporary art on the walls that make this bedroom a star. 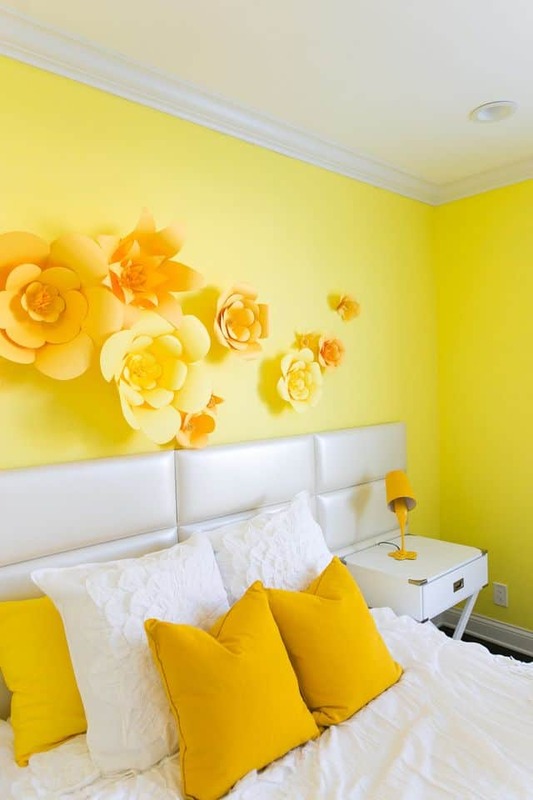 Of course we couldn’t make a list of yellow bedrooms without adding one that has a bit of black and white involved. It’s a classic trio of colors that works well for contemporary interior design lovers. And Domino featured this beauty. Deco redo went the flea market route with this eclectic creation. 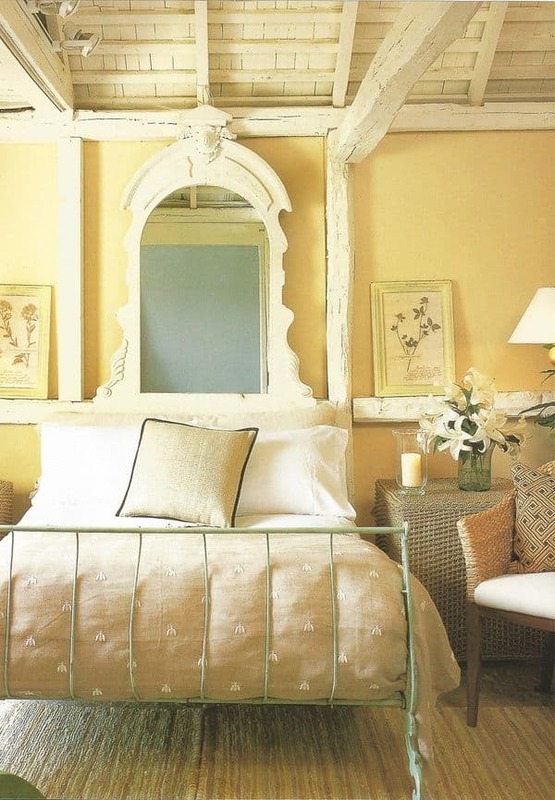 There’s a light, butter yellow on the walls and a vibrant, golden yellow covering the headboard. All of the other ins and outs of the room just make it a bit more funky and fun. 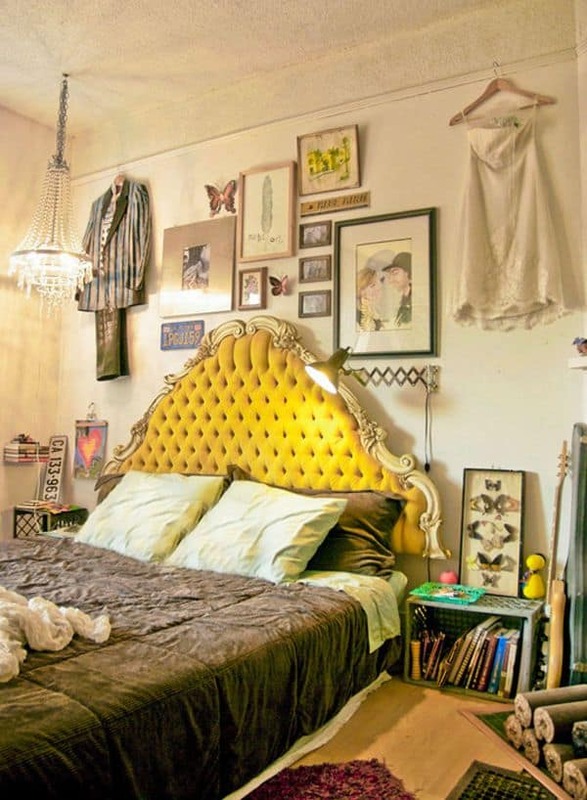 Here’s another young lady’s bedroom that we’re quite fond of. It’s the perfect mix of big girl and charming darling with the art and modern touches. Serena and Lilly has more to get inspired from. Technically, this is a cream room, but because of its crisp foundation the mustard on the bed really takes the focus. We love the clean palette of this modern, minimal space. And we thank Pinterest for giving us these great bits of inspiration. Ideal Home went with one of the trendiest of all color pairing; yellow and gray. It’s subdued and romantic but because of the brightness it still adds that happy, funky vibe we all love when working with the upbeat tone. And it’s perfect for more youthful spaces as well. And finally, we’re back at BHG with another vintage, cottage-inspired space. It’s feminine and has a definite throwback feel. But, it’s also one that is quite welcoming and warm – perfect for a guest room.